Whitley Z6834 crashed in the North Sea 29/1-1943. The aircraft belonged to RAF 3 OTU Coastal Command and was coded KG-? At 14:05 hours the pilot Sgt Dennis Victor Corrigan reported that he would return to base due to engine problems. A little later he announced that he would have to ditch the Whitley. The dead body of Co-pilot W/O James Alfred Cook was found drifted ashore on the beach two kilometres south of Lønstrup on 15/4. 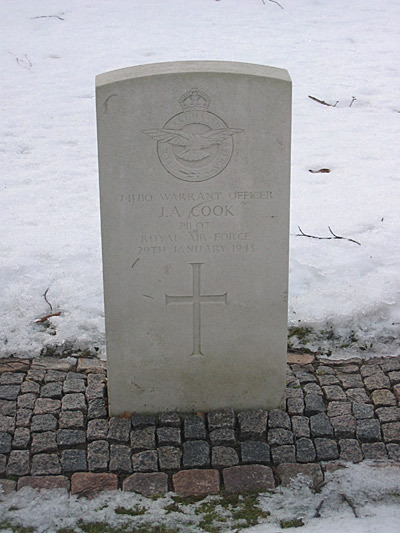 He was laid to rest in Frederikshavn cemetery on 21/4-1943. The five other members of the six man crew have no known graves and are commemorated on the Runnymede Memorial. Sources: BF, Flyhistorisk Tidsskrift, CWGC.